A police officer involved in a struggle which led to the death of Sheku Bayoh “may never be fit to stand trial” over data protection allegations, a court has been told. Nicole Short, 30, of Glenrothes, Fife, was due to appear for trial at Kirkcaldy Sheriff Court tomorrow accused of illegally accessing information on the police computer system ahead of a trial later this month. Short was involved in the struggle that led to the death of father-of-two Sheku Bayoh in Kirkcaldy’s Hayfield Road on 3 May last year. She was said to have been “badly hurt” and “feared for her life” as a result of the incident. Police Federation bosses say she suffered “significant” injuries during the incident that led to the 31-year-old’s death. The trial, which was originally to be heard at the start of 2015, was then adjourned until last October, and again postponed to this month. But at a pre-trial hearing, lawyers said psychological and neurological assessments on Short had been carried out - and that she may never be able to appear in the dock. At an earlier hearing Kirkcaldy Sheriff Court heard PC Short had been involved in an “incident in Kirkcaldy” that had led to a “complicated medical state”. The hearing comes weeks after Short was pictured taking selfies with Celtic captain Scott Brown at a match at Parkhead. Sheriff Grant McCulloch will make a decision on how to take the case forward later this month. Short plead not guilty on summary complaint to three charges under the Data Protection Act. She is accused of accessing confidential information on the Police Scotland computer system in October 2012. 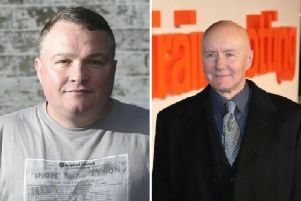 Short is accused of obtaining personal data relating to two men from Fife Constabulary’s Crimefile system and the Scottish Intelligence Database for non-policing purposes in a separate incident. Mr Bayoh, 31, collapsed and died after being restrained by several officers who were following up reports of a suspect wielding a knife. The case is currently being investigated by police watchdog, the Police Investigations & Review Commissioner.